WHEN Ann Walker opened Trez-Ann hair salon in Staple Hill in the late 1960s, Mary Quant's geometric bob was all the rage. Since then, Ann has seen hair fashions change like the wind - from the long straight hippy styles of the seventies and the spiral perms of the 1980s to the 'Rachel' cut of the 1990s and, more recently, the trend for ombre hair colour. But 47 years later, Ann has finally decided to hang up her scissors and retire. Ann opened the salon in Victoria Street with husband Keith in 1969 and continued to work there when her daughter Lisa Franklin took over in 2003. After moving to West Huntspill in 2014, Ann has been travelling in two days a week to work at the salon. 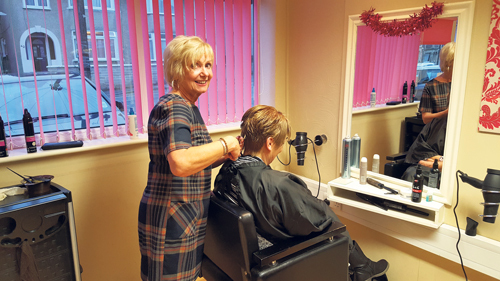 Remarkably, Ann, who is now a widow, has been cutting the hair of six clients for more than 40 years with two of these visiting Ann as teenagers since the salon opened. Ann, who was 65 on December 18, said: "I've been in the shop since I was 18, so felt the time was right time to retire. I had a house behind where I had my three children but still worked full-time. I loved it. "The techniques have changed over the years but the colours that are in now like the pinks, the greens, the blues and the purples were all out when I was training. It's done a full circle with little tweaks. If you've been trained to cut properly, you can adapt to any style but you've got to have the interest. 've trained about eight apprentices and they only left when they had families. I loved teaching them and have totally enjoyed all my time here." Ann and Keith bought the salon, which came with a two-bedroom flat, shortly after they tied the knot. As their family grew with daughter Lisa and sons Neil and Mark, the couple extended the property, with Lisa starting work there 29 years ago and Neil doing a stint as a Saturday boy as a youngster. In 2003, Ann and Keith decided to take a break so Lisa and her builder husband Paul took over. Paul used his building expertise to renovate the property into a separate flat and shop and then made the salon bigger. Ann said although hairstyles have changed over the years, there is one which keeps coming back in fashion. "The bob is the most in demand hairstyle. It comes in and out of fashion all the time, all with different variations - long versions, short versions, layered versions. I've seen them all! "I enjoy cutting the most but I also love doing wedding hair. It's a speciality and I've done loads over the years." Ann said she will miss the buzz of working in a friendly and busy salon: "It'll be sad to leave. I will miss the banter, the girls and obviously the clients. I shall have to find something else to do as I don't want to be a couch potato. I love socialising and would like to take up yoga again and do all the things I've just not had the time to do." Lisa, 45, who has two children, Courtney and Archie, said: "Mum has been saying she will retire so many times so we all say 'We'll believe it when we see it' but now she's been telling everyone so this time it's finally happening! "The salon was named Trez-Ann after my mum by my dad. She is Trez-Ann, even though we've had the salon for 13 years. We thought about changing the name a few times, but because my dad, who passed away five years ago, named the salon, I don't think I could. Part of me wanted to give it a more modern name, but it wouldn't be right. "Working with mum is all I know. We're going to miss her a lot." Ann's last day at work is December 30 when she will be celebrating with a get together at the salon with some of her clients.